Slate’s Hang Up and Listen discusses NBA player Russell Westbrook and basketball fashion. What Is Russell Westbrook Wearing Today? Hang Up and Listen decides if the basketball player is fashion-forward or not. 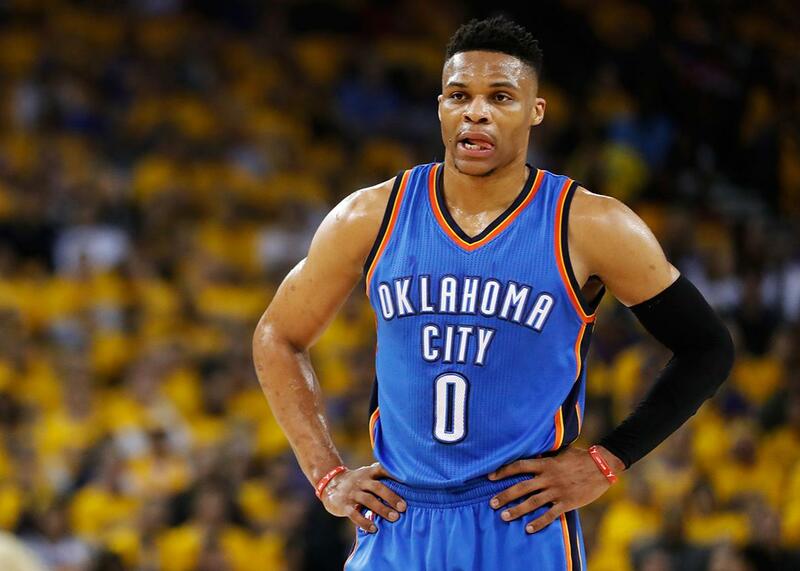 Russell Westbrook of the Oklahoma City Thunder during game one of the NBA Western Conference final against the Golden State Warriors on Monday in Oakland, California. On this week’s Hang Up and Listen Slate Plus bonus segment, Slate deputy editor John Swansburg joins hosts Josh Levin, Mike Pesca, and Stefan Fatsis to critique basketball fashion. NBA star Russell Westbrook is turning the court into a runway—with rule-breaking Patagonia cutoffs and bandanas. But is the player a fashion-forward rebel, or is he just fashionably famous? Listen to find out what the hosts think.